For quite sometime I have been playing with JS libraries and Visuaforce to build some useful UI components, Textscanner is one of the component that has emerged from the same experiment. Textscanner is Visualforce implementation of Knwl.js natural language reading library. You can read about the same here https://github.com/loadfive/Knwl.js . What Texscanner does is wrap this nice little library with the help of visualforce components. Support Center / Call center executive has to interact with many customers daily and they really need to have the key information handy from a lengthy description. 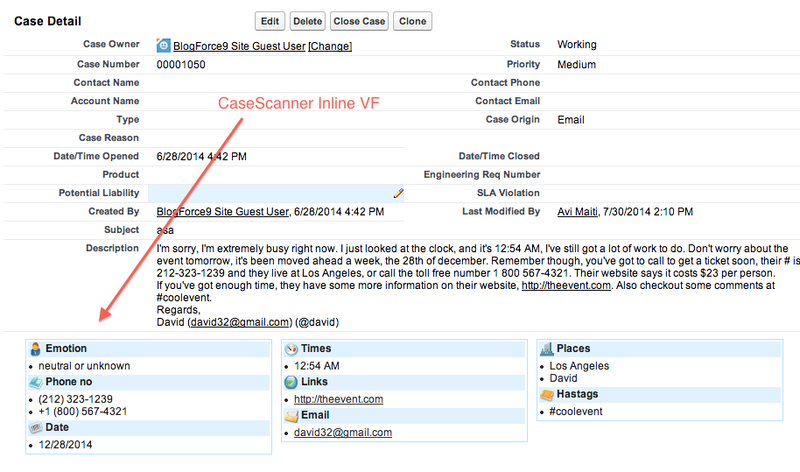 So solve this we can create an inline VF page CaseScanner in our case using TextScanner and include the same in Case Detail page layout. Where can you use it ? can we use it on LEads?